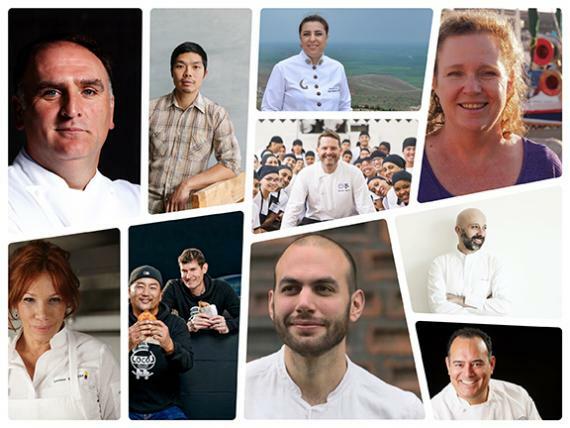 The Top 10 finalists of the Basque Culinary World Prize, an award for chefs around the world whose projects have improved society through gastronomy, were announced today. The announcement was made at an event at Palacio Miramar in San Sebastián. The winner, who will be chosen by a jury of the world’s most respected chefs and experts in different aspects of food culture, will be announced on 18 July this year in Mexico City. He or she will be awarded €100,000 to devote to a project or institution of their choice that demonstrates the wider role of gastronomy in society. The Basque Culinary Prize is organized and promoted by the Basque Government under the Euskadi-Basque Country Strategy and the Basque Culinary Center (BCC), a world leading academic institution in gastronomy. In 2016 the prize went to Venezuelan María Fernanda Di Giacobbe, who won for her Cacao de Origen project in Venezuela. For two months, professionals and institutions within the profession nominated chefs from anywhere in the world who demonstrated how gastronomy could become a transformational force in areas ranging from innovation to education, health, research, sustainability, social entrepreneurship and philanthropy, and the preservation of local cultures. A generation of international chefs have now expanded their role in society and redefined their profession by integrating new skills, creativity, innovation and social concerns into their approach. The Basque Culinary World Prize celebrates this evolution. These ten shortlisted chefs were chosen by a prize committee chaired by chef Elena Arzak, head chef at Arzak, the renowned 3-Michelin starred restaurant, and academics from respected international institutions. The Top 10 reflects a movement started by pioneers including Ferran Adrià, Gaston Acurio, Dan Barber, Heston Blumenthal, Massimo Bottura, Claus Mayer, Jamie Oliver, Rene Redzepi and Alice Waters, amongst others. Rather than contributing to the problem of climate change, food should be part of the solution.’ So say chef Anthony Myint and writer Karen Leibowitz, who have unflinchingly presented a conscious approach to food by sharing information and tools that create a positive impact on the environment. But, it wasn’t enough just to talk about it. Myint and Leibowitz also founded ZeroFoodprint, an organisation which works with restaurateurs to try to completely eliminate their carbon footprint. As owners of restaurants including The Perennial, they set up The Perennial Farming Initiative to provide funding for programs in ‘progressive agriculture’ and to encourage changes in the industry, from farm to fork. After leaving René Redzepi’s kitchens (with whom he ran Noma), Dan Giusti recently set up Brigaid, an initiative that helps schools rethink the design and functionality of their kitchens. The know-how of talented chefs is brought into school kitchens to generate real, substantial changes. They work to serve ‘real food’ and to rebuild basic yet forgotten practices like taking our time over the food served at our tables. Daniel Patterson’s extensive experience in fine dining merges with Roy Choi’s expertise in street-food to create Locol, a joint restaurant chain project in the USA committed to changing the fast-food concept. Far from being some fantasy around healthy eating, Locol is a very real project that benefits all involved. The initiative supports a “fast-food revolution” and changes the stigmatized link between race, food and poverty to show that we can eat better for less. A distinguished advocate of social gastronomy in Latin America. More than ten years ago, David set up Gastromotiva in São Paulo to provide free culinary training to young people from poor areas, with a view to finding them employment in the catering industry. He has built a community support network that includes workshops for children and cooking courses in prisons. The project also now operates in Rio de Janeiro, Salvador de Bahia and Mexico City, including a soup kitchen - Refettorio Gastromotiva - created at the Olympics in Rio in collaboration with Massimo Bottura´s food waste project: Food for Soul. In the Harran region in the south-east Turkey – where refugee camps are home to some 14,000 Syrian refugees - Ebru Baybara Demir leads the Harran Gastronomy School Project, an initiative to improve the employment prospects of economically vulnerable Turkish and Syrian women through culinary training. The project also builds bridges between Turkish and Syrian culture, providing refugees with training in gastronomic tourism which draws on the region’s historic and artistic heritage. Time magazine cites José Andrés as one of the most influential men on the planet. For Andrés, it’s not enough to have a vast chain of successful restaurants or to be a media figure – it’s about generating lasting change in multiple aspects of the food industry. Based in Washington, the Spanish chef has entered politics to promote immigration and labour reforms, as well as ‘a smarter approach to food policy.’ He also uses his profile to raise funds for projects which use cooking as a driver of social change. A Citizenship Ambassador for the Obama Administration and an ambassador for the Global Alliance for Clean Cookstoves launched by Hillary Clinton, he also runs his own initiatives including World Central Kitchen, plus education and training programmes in countries such as Haiti. Leonar Espinosa is known for taking great pride in the cuisine of her country, as well as nurturing and promoting the value of its biodiversity. Through the Funleo foundation, Espinosa revives the ancestral knowledge and know-how of mainly indigenous and Afro-Colombian peoples. She supports rural development based on food sovereignty, and promotes routes to market for small producers as well as spaces for education, nutrition, enterprise and tourism in ethnic locations. In addition to gathering support for opening a Comprehensive Gastronomy Centre in Golfo de Tribugá as an alternative framework to drug trafficking, she urges Colombia to raise awareness of its culinary richness, and wants its communities to take responsibility for transforming their biological, cultural and intangible heritage into tools for socio-economic development. In the north of Lesbos, chef Melinda McRostie provides support and provisions to hundreds of thousands of refugees from Syria, Pakistan, Afghanistan and Iraq, in collaboration with the local authorities. She initially welcomed refugees into her own restaurant The Captain's Table before setting up the Oxy transit camp to provide food, water, refuge, medical facilities and buses to the capital Mytilene. The camp now has a food truck providing hot meals. The Asterias-Starfish Foundation - a project set up by the chef – comprises of 90 employees and thousands of volunteers from across the world. It addresses the humanitarian crisis and works mainly with orphaned children and families in need. In collaboration with Sapienza University of Rome, the Italian chef has devised a system that enables hospitals to serve healthier and tastier food, which in turn improves the physical and emotional wellbeing of its patients (45% of all hospital food ends up being thrown away in Italy). Niko Romito has redesigned the hospital food chain via the Inteligencia Nutricional project, using techniques and concepts developed at his Michelin-starred restaurant Reale to improve the sensory quality of the meals and to maximise the nutritional value of its ingredients – and all within hospital budgets. The 10 Basque World Culinary Prize finalists were chosen by a multi-disciplinary Prize Committee who met on Monday 12 June at the Basque Culinary Center in San Sebastian. They were chaired by celebrated Basque chef Elena Arzak and included an international group of academics with expertise in various aspects of food culture and gastronomy such as Joxe Mari Aizega, General Manager of Basque Culinary Center; Jorge Ruiz Carrascal, Professor of the Department of Food Science at the University of Copenhagen; Marta Miguel Castro, a Research Associate at the CIAL Institute of Research in Food Science, who studies how food components could prevent disorders such as diabetes and obesity; Melina Shannon Dipietro, executive director of Rene Redzepi’s MAD project; and Dr F. Xavier Medina, author, social anthropologist and leading scholar of Food and Culture at the Universitat Oberta de Catalunya (UOC) in Barcelona. Entries came from 30 countries worldwide, and a total of 110 chefs were nominated. To be considered for the award, chefs had to be nominated by another professional currently working in the world of gastronomy - for instance, another chef, food writer or food supplier, or an institution. A winner will be chosen from the final ten by a jury of the world’s most influential chefs including Gastón Acurio (Peru), Michael Bras (France), Dominique Crenn (US) Yoshihiro Narisawa, (Japan), Enrique Olvera (Mexico), and Joan Roca (Spain). The Jury will also include leading experts in related disciplines, including novelist Laura Esquivel, author of the hugely popular novel Like Water for Chocolate; Kirmen Uribe, one of the most widely read and translated Basque language authors; Cristina Franchini, expert in humanitarian action (Acnur), and Matthew Goldfarb, organic farmer, rural sociologist and expert in sustainable production; and María Fernanda di Giacobbe, winner of the 2016 Basque Culinary World Prize.